Tomorrow, students in the Environmental Law and Policy class I am teaching at UCSC will discuss the Endangered Species Act,or ESA. The ESA is a legislative enactment that spells out, in the "political world" that we create and most immediately inhabit, a rule that is intended to prevent our human activities in that world from doing irreparable damage to the "natural world," a world that we didn't create, and a world that ultimately supports all life, including our own. Unfortunately, as the textbook observes, the clear and simple commands of the ESA have been consistently undermined by court decisions and agency actions. Though we can "speak" the truth about the relationship to the natural world that we want to have, "doing the truth" has proven more difficult. The desire to do what we want, in our world, even though we know that this means death to the world of nature, is just too compelling. Time after time, we find a way to escape from the simple and straightforward commitments that we have purported to make in the ESA. The ESA, really, is very simple in its demands. The law is quite clear. The agencies of our government are supposed to "ensure that actions authorized, funded, or carried out by [federal] agencies do not jeopardize the continued existence of ... endangered species or threatened species or result in the destruction or modification of habitat of such species ...." U.S.C. Section 1536 (1973). This is what we have told ourselves we want to do, with respect to actions that put other species in danger. To paraphrase, we have enacted a law that tell us to "respect all life." Pictured is the American Pika, a small alpine mammal that is declining due to global warming. It inhabits few places, among them the Sierra Nevada. 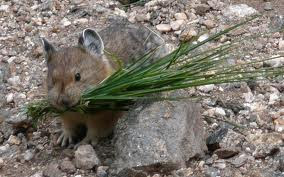 In February 2010, the Obama Administration decided not to list the Pika as endangered. It is, in fact, endangered indeed. Deciding whether or not to kill off the natural world is not a decision best left to the bureaucrats. We all need to know about what we are actually doing, so we can adjust our individual and political actions to accomplish the purpose of making sure that our actions in the human world do not destroy the natural world upon which we all ultimately depend. To be informed, I suggest signing up for information and action alerts from the Endangered Habitats League and from the Center For Biological Diversity (among many good organizations working on endangered species issues). Sending them some money, too, would not be amiss!